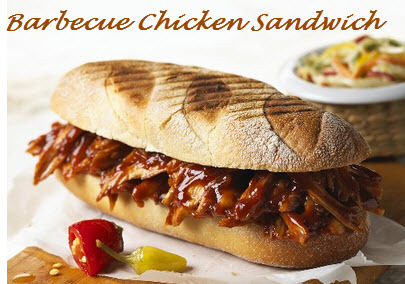 I have always made barbecue baby back ribs, but didn’t really think to make barbecue chicken – especially a sandwich, silly I know! The other day I was watching TV and got inspired. Here is a recipe that I think every barbecue lover will enjoy – especially those who don’t eat pork. Heat a 12-inch skillet over medium heat. Season both sides of the chicken thighs with salt and pepper. Add the oil to the skillet, and then the chicken thighs. Sear both sides of the chicken until golden in color, about 4 minutes per side. Add the BBQ Sauce to the chicken. Bring to a simmer, and then place in the oven for 15 to 20 minutes to let the chicken cook through.If your skillet is not over proof, transfer chicken on to a baking dish. Allow the chicken to cool, then, using two forks, shred the chicken. Top one brioche roll half with the chicken and spoon the mayonnaise and onion white sauce over and top with the second half of the roll. Can be served with any side just as you would other barbecue. In a small bowl combine the mayonnaise, cider vinegar, lemon juice, onions, and some salt and pepper. Can be stored in the fridge for up to 4 days in an airtight container . ***Cook’s Note: Feel free to substitute chicken thighs for chicken breast for a lower fat dish. You can also substitute brioche rolls for ciabatta bread or toast.